Many women now like to exercise during pregnancy and for many there is no reason at all why they shouldn’t. There is, however, some information and knowledge that is good to have under your belt when deicing what is right for you. Making changes whilst pregnant can also benefit your post-birth recovery and rebuild. 1. Maintain rather than gain – Remember you are now in a maintenance phase rather than one of achieving any new goals or personal bests within your exercise program. 2. Rate yourself – Working to a Perceived Rate of Exertion (PRE) of seven out of 10 is recommended, with one being ‘sitting on the couch and doing nothing’ and 10 being ‘can’t possibly do any more’. 3. Stay cool – Monitor your temperature during exercise. Your internal temperature is higher than your external and your baby has no way of cooling themself down. Prolonged periods of raised temperatures may cause harm – it may be worth skipping those hot yoga sessions or spin classes for a while. 4. Low impact – Concentrate on low impact exercise at this time; some women continue to run during pregnancy and everyone is different, but now is not the time to take up running. Remember, every time you run your pelvic floor is under more stress, so if you feel any kind of weakness or incontinence it may be time to stop for a while. Some of the good low impact exercises are pilates, yoga, swimming and walking. 5. Stay stable – Be aware of changes to your center of gravity during pregnancy. You may find that a certain exercise you have done earlier in pregnancy become more difficult as your belly gets bigger. You also should also avoid lying flat on your back after the first trimester to avoid putting pressure on the vena cava, which may decrease your blood circulation. 6. To lunge or not to lunge – This provides a point of debate amongst many fitness professionals. My advice would be that if your exercise program has contained lunges prior to you becoming pregnant, and you are fit and strong and you are not experiencing any pelvis or sciatic pain, you may be fine to continue to do lunges with a low weight through your pregnancy. Remember, however, if you start to feel any pelvic related pain or discomfort you should choose another leg exercise at this time. And certainly if you have never done a lunge before in your life, now is not the time to start. 7. Exercise is good – In most cases staying active and exercising through your pregnancy is of benefit to both mother and baby. HOWEVER, if you feel strange or unwell at any point, now is not the time to push on through. Stop what you are doing and seek the advice of your health or medical professional. Women’s fitness trainer and an author, Jen Dugard, specialises in pregnancy exercise programs, as well as helping mothers to get back into shape post-birth. The highly motivated mother of two, is running a multi award-winning business "Body Before Baby", “Body Beyond Baby” & "Tough Mums" that provides the largest “specific to mums’” group exercise classes in Sydney. 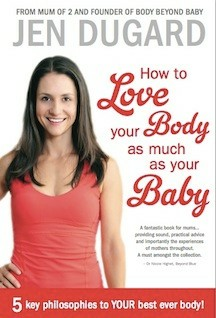 The author of “How to love your Body as much as your Baby” and a postnatal exercise DVD “Rebuild from the Inside Out”, she is a regular expert fitness contributor in various media publications on women’s fitness before, during and after pregnancy, as well as running educational workshops and presentations. Whilst pursuing her own physical fitness passion as an elite obstacle racer, Jen’s message on exercise as a mum is simple: “you must take the time to re-build from the inside out to become stronger, fitter and more confident than you have ever been”. What exercises do you do during your pregnancy?